This was a fun evening. I got to spend the evening with Cindy from Happy Hour Guidebook 2013 Portland and she introduced me to Leslie who owns this great establishment. I always love getting the inside story and hearing the dedication it takes to run a restaurant. Luckily for me there are lots of people like Leslie that work their tail off to make sure food is spectacular and ambiance is charming and service is great, just so I can eat and share with all of you. I had been to Thirst one other time years ago and it was for a private event. I remember it well. We had the whole entire restaurant to ourselves and it was a really cool event. Fast forward a few years and now I get dinner and I get to give you a review of Thirst Wine Bar & Bistro. For our appetizer we could have chosen to share a baked brie, but instead we each had a Caesar salad. I am pretty picky about my Caesar salads and this one was great and she later told us it has no anchovies and light on the garlic. Perfect! There is no great way to take a picture of this, but this Beef Ragu over polenta was the queen mother of all comfort foods. 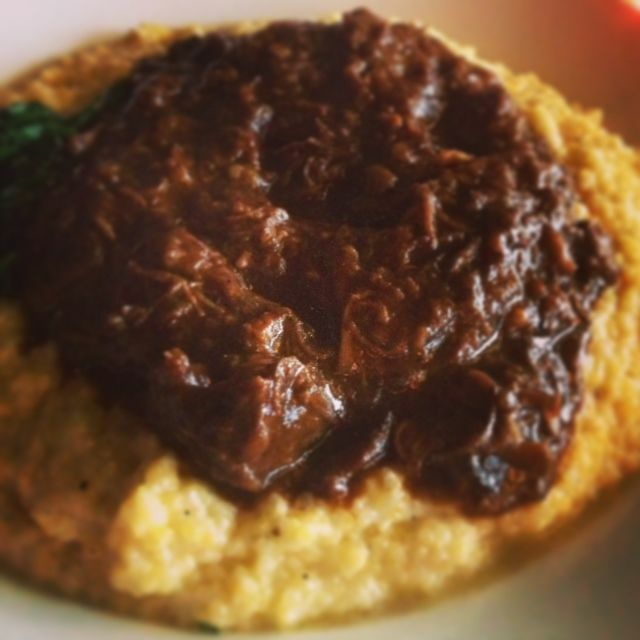 I chose the Coffee Rubbed Beef Ragu over Creamy Truffle Polenta. The polenta was heavenly. HEAVENLY!!! The beef ragu was also spectacular, it was comfort food at it’s best. It was a stormy evening, so this meal fit the day perfectly. I’m even going to share with you that I had the leftovers for lunch the next day and it was still amazing. I had to hurry and eat them before any other family members discovered them. Selfish you ask?? Yes, yes I am. 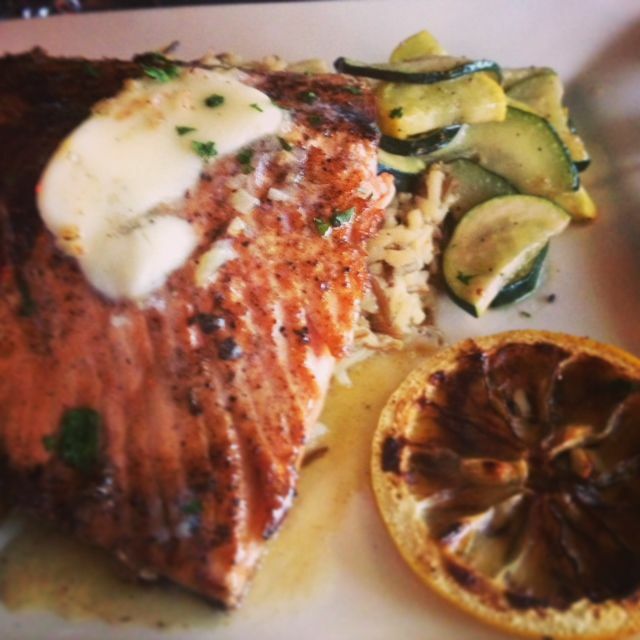 Grilled Sockeye Salmon with Rice Pilaf. Cindy ordered the Salmon dish with rice pilaf and sauteed veggies. It was a very good, gluten free option on the menu. Also very nice sized portion and very filling. And I won’t lie, much healthier than what I ate. Still no regrets on the Beef Ragu. 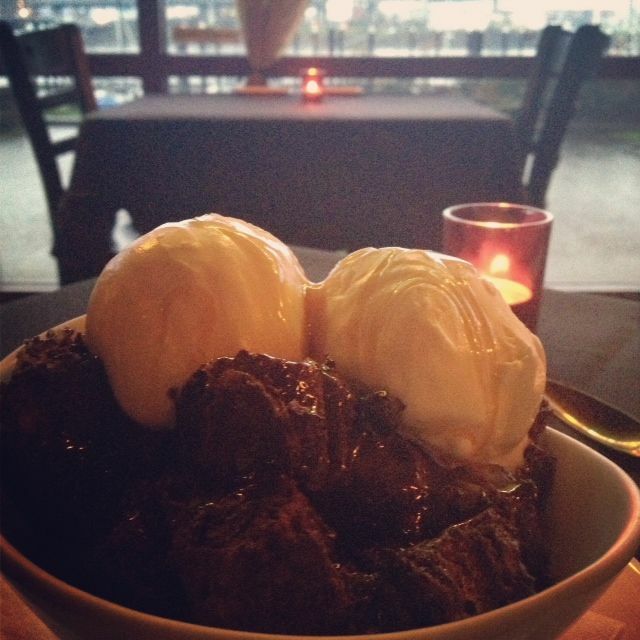 For dessert we had the dark chocolate bread pudding with ice cream. By now I was stuffed, but the presentation on this things was so pretty. I like pretty food! It was really rich, so I only had a few bites, but wow, I have never had chocolate bread pudding, so it was such a special treat. If you want to find out what will be offered on their Thirsty Tuesday menu follow them on Facebook. You can also find Cindy on Facebook as well at Portland Happy Hour Guide Book. Atmosphere is very cute, romantic and they have paid a lot of attention to detail. Plus they have tons of outdoor seating in the summer, and it’s right on the river. Service was great. They checked on us often and filled our glasses, whether water or wine, every time. Pricing was great, especially with the bottle of wine included. I didn’t look over the other menu a lot, but it seemed like it was well priced, it’s just the Thirsty Tuesday was such a great deal. This is a wine bar so there is a ton of wine to choose from. I did look around and see that they do also offer some beer and cocktails. So just because you’re not a wine drinker doesn’t mean this place is not for you. Thirst Wine Bar & Bistro is located on the river. It was a great choice (Cindy’s, not mine) and it was fun to finally meet her.